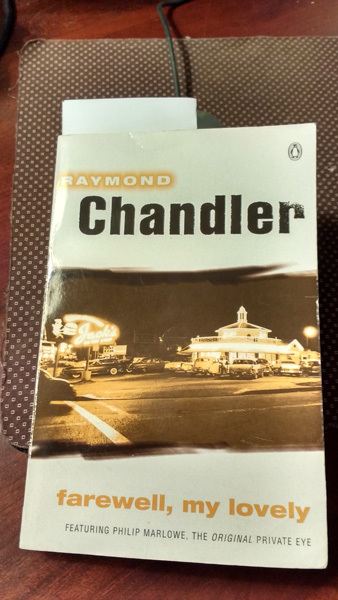 Here’s something of interest I picked up yesterday at the Ephrata Public Library’s annual Mystery Lovers Book Sale, a copy of Raymond Chandler’s Farewell, My Lovely. 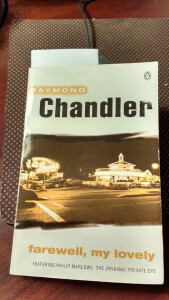 (Photo,right) Chandler was a pioneer of in the 30’s and 40’s noir crime fiction with his Phillip Marlowe private detective character. None of that is all that extraordinary; it’s common knowledge. Yet, there’s several curious things about this paperback edition. One, it has a copyright date of 1949, but the cover art suggests something far more modern. I’ve identified some editions with this cover to 2005. However and second, the typesetting (Monotype Fourier) suggests that the book was reprinted from an earlier edition, like the 1949 one. Third, while printed in England, the home of Penguin books, the detail shown on the reverse suggests that the book was distributed by Penguin Italia, in Italy, in 1999 (20/09/99). 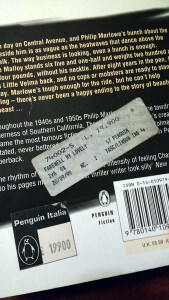 Note the two applied tags (Photo, left). Finally, though you cannot see the two prices on the back, under the barcode (thanks to my lousy camera photography skills), they are for the UK and Australia. The price for Italy was added by the addition of a sales sticker: 19.900 Lira or about $12.00 at today’s exchange rate. But even more curious is this, the book’s travels. A book written by an American author, first published in America, subsequently reprinted and republished in the UK over many decades, then reprinted, distributed, and sold in Italy in 1999, turns up in a used book sale in Ephrata, Pennsylvania, USA, in 2016. It would have been interesting to tag along on this book’s itinerant journey. I think so. Within the book is a story, and the book has a story too.